Sensory Concerts coming to Glenbrook in April | Your Music Inc.
10.30am and 11:45am, Saturday April 6. 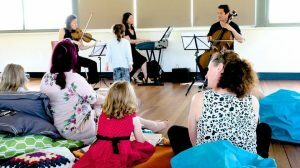 Children and adults with sensory issues and special needs have a rare opportunity to take part in an inclusive classical music concert in Glenbrook, in the Blue Mountains west of Sydney. The Sensory Concerts® are returning to Glenbrook in April, where the Blue Mountains-based organization made its debut performance nearly two years ago. Sensory Concerts® are designed especially for children and adults with special needs including Autism, ADHD and sensory processing disorder. For people who might normally feel overwhelmed in large crowds, or by noise, lights and touch, Sensory Concerts® give them a rare opportunity to take part in a live classical music performance where they are able to move around, vocalise or retreat as needed. The concerts will be performed in a small group with different seating options, qualified therapists available for support, and a musical program specially designed for sensory needs. Performing at Glenbrook will be Sensory Concert® founder and highly acclaimed concert pianist Grace Kim, Opera Australia Orchestra principal cellist Teije Hylkema, and special guest performer Colin Grisdale on trumpet. Providing support if needed will be collaborating professionals psychologist Jane Wearn, occupational therapist Josey Sharpe, and physiotherapist Jenny Wu.